← Why Does Reloading Data Vary? I have always enjoyed collecting and shooting old military firearms. One of my favorites has always been the 30 caliber M1 Carbine. Though many people will claim they are useless for anything more than plinking, I respectfully disagree. They are plenty accurate for small game and varmints out to 100 yards or so and I feel it is more than adequate for a home defense/personal protection weapon. It was never designed to be a powerful long range rifle, it was designed to be a lightweight easy-to-use carbine that had more power and accuracy for troops that would ordinarily be issued a 1911 45 caliber pistol. Many officers, NCO’s, Tank and Artillery crews were issued the carbine. I bought my little carbine in 1990 at a local gunshop, at the time I paid $185.00. Today the price of them has skyrocketed. My carbine was manufactured by the Inland division of General Motors, which produced over 2.3 million of them during World War 2. Many companies manufactured the M1 Carbine for the war effort. Companies such as IBM, Underwood Typewriter, Rock-Ola Jukebox, Saginaw, National Postal Meter, Inland and Winchester who originally designed it, all combined produced some 6.5 million M1 Carbines. Last weekend I loaded up some ammo with Hodgdon H110 and the Sierra 110 gr. FMJ Pro-Hunter #2105 and went to the range with my General Motors stamped, 1943 M1 Carbine. First I set up a bunch of clay pigeons at 100 yards and was breaking them fairly easy. I decided to set up a target and see just how well it would group at that distance. I think it did fairly well, I shot a 5 shot group of 2.541”. The M1 Carbine is a lot of fun to shoot. Lightweight, low recoil and has a 15 round magazine, what’s not to like? This entry was posted in Reloading and tagged carbine rifle, m1 carbine, military rifles, old military rifles, reloading. Bookmark the permalink. The M1 Carbine filled a niche that needed filling. It has a greater range than the 1911 which is always a good thing in combat It has greater muzzle energy than the 1911 also. I also have a 1943 dated inland. Mine has Korean armory markings on it. I paid $300 for it in the mid 90’s. It shoots a little over an inch at 50yards. I load H-4198 with 110grain fmj’s. Its plenty accurate for what it was intended to do. The original PDW. Gary: I agree completely! I also have a 1943 Inland. I purchased mine from the DCM sometime back in the early 1960’s. It came in a nice wooden box with sling, oiler, and 2-5 round magazines. All that for $17.50 plus $6.00 shipping I must have been extremely lucky because mine appeared to never have been issued. There were no dings or scratches in the wood or metal. It has a cross bolt safety. Most I have seen have the turn type. It has a nice walnut stock and handguard. I also have a early Ruger Blackhawk in 30 carbine caliber. Both are loads of fun to shoot and very economical using cast bullets. Brass is easy to come by and inexpensive. My carbine has taken many coyotes over the years by calling them in to around 100 yards. It shoots gas checked cast bullets into around 3″ at 100 yards from a bench. The Blackhawk easily matches that. Thanks for checking out our blog. Wow $17.50, I think you made a good investment. The M1 Carbine is one of the most under appreciated rifle in American history. Lots has been said about it’s weak performance but in almost every picture or film of WWII or Korea, you see a Carbine being used. These guys figured out pretty quickly that it was easier to carry than a Garand, and in combat, the typical target distance is rarely over 50 yards. I also think it’s a “macho” thing. The 30.06 is more of a “manly” round. They made 6.5 million in less than 5 years and they were still being issued to Montagnard and Hmong troops in Vietnam. I suspect they are still being used somewhere in the world. I have a ’44 Winchester and it’s a fun gun. Right at home on the Army A 1000 inch ( 25 meter ) target. I notice that you measured your group from outside edge to outside edge. I use center to center. Which is correct? Thanks for the reply. The way you recommend the electronic calipers do the arithmetic. I love the M1 Carbine and own three of them, a Rock-Ola an Inland and a National Ordinance and i have taken a few whitetail deer with them using soft nose 110 grain bullets. The largest deer that i ever killed, an eight point weighing 325 lbs after being fully field dressed. I shot it one time broadside thru both lungs at about 50 yards and it ran only about 35 yards and was dead when got to it about two minutes later. A 30 carbine is deadly with soft nose ammo providing you stay within one hundred and fifty yards. ——–Don Turner 75 year old hunter from the beautiful West Virginia hills. I use these bullets in my Carbine for CMP as issued competition games. 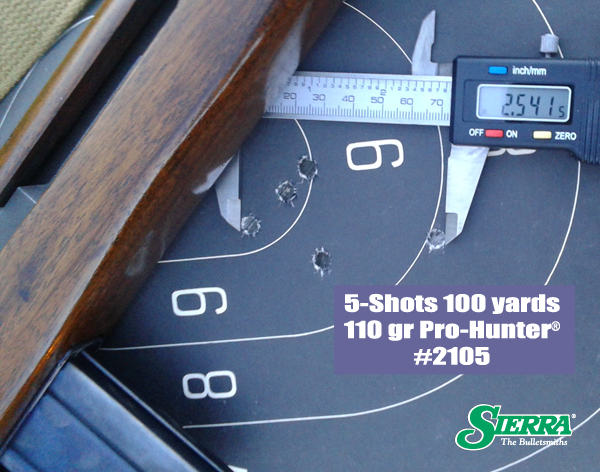 Why has Sierra discontinued the #2105 FMJ bullets!